Currency pair Euro Dollar EUR/USD completes the trading week near the area of ​​1.1444. The pair continues to move within the correction. Moving averages indicate a bearish trend. At the moment, we should expect an attempt to grow and test the resistance area near the level of 1.1485. Where is expected to rebound and the continuation of the fall of the euro/dollar. The potential target of the decline is the area below 1.0975. 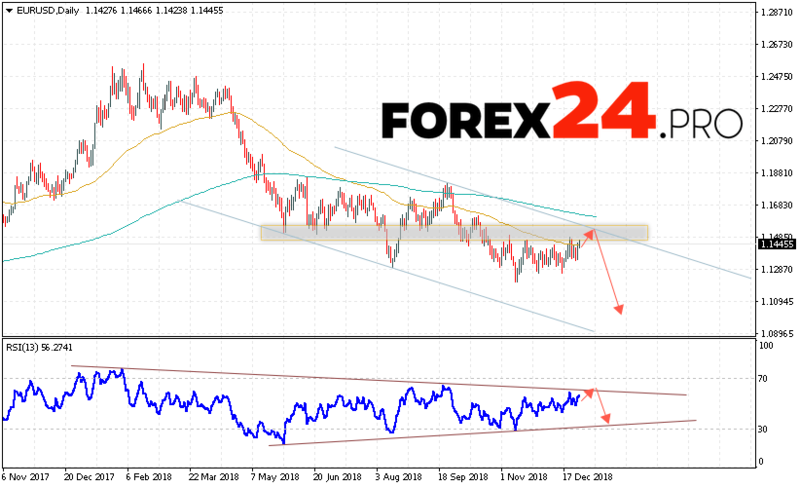 The test of the trend line on the relative strength index (RSI) will be in favor of the EUR/USD currency pair falling at FOREX. And also test the upper limit of the downward channel. Cancellation of the option of falling quotations of the pair in the current trading week December 31 — January 4, 2019, will be a strong growth and the breakdown level of 1.1650. This will indicate a breakdown of the upper boundary of the downward channel and the continued growth of the pair in the area above the level of 1.2050. With the breakdown of the support area and closing of quotes below the level of 1.1185, we should expect confirmation of the development of a downtrend in the pair. Among the important news from America and Europe in the next trading week, which may have an impact on the EUR/USD rate, it is worth highlighting: ISM Production Index, Consumer Price Index, Unemployment Rate, Changes in the number of people employed in the non-agricultural sector. EUR/USD forecast & analysis December 31 — January 4, 2019 implies an attempt to test the resistance area near the 1.1485 level. Where can we expect to continue the fall of the pair in the area below 1.0975. In favor of the fall will make a test trend line on the indicator of relative strength index (RSI). Cancellation of the option of reducing the euro dollar will be a strong growth and the breakdown level of 1.1650. In this case, we can expect the pair to continue to grow with a potential goal at the level of 1.2050.